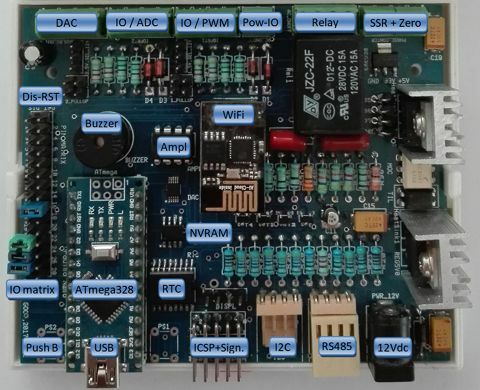 The ATmega328 PLC is a credit card controller packed with many useful functions. It is light weight, consumes low power, has a DIN rail case, build in display, backup power and is scalable. With this PLC you can build and control anything you like. Compared with other PLC’s there is no need for special power supplies, or other interface modules. Practically any sensor from any manufacturer can be connected. On top of all this it is cheap compared with others PLC’s in the market. 4x digital IO/PWM protected . 2x DAC 12bit 0..10V 1.0 Amp powerout. 1x SSR relay with zero detection 120Vac 10Amp. Combined with the DIN rail based Central panel solution this PLC can give very compact control over your processes. 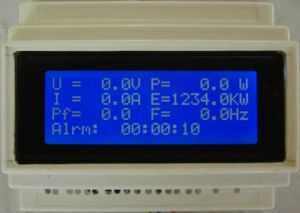 The picture below shows the PLC as monitor and measuring device of the electricity grid. This application can activate generators and backups at times when the CFE has blackouts. ( Grid values are zero because the photo is for demonstration purpose). The PCB is a high quality double layer made of glass fibre, 1.5mm thick, routing is done with 10mil traces. The PCB measures 100×68 mm has 85 components, the enclosure measures roughly 107x88x60 mm. Below an image of the PCB layout and the various functions and interfaces. This PLC was developed for different reasons. One reason was to generate a flexible control platform with a display integrated to control any process you like. A second reason was to offer a complete integrated PLC solution to any one like students professionals and engineers. With this PLC you can focus on your job instead of being busy how to assemble and install a PLC controller. Should run from solar panel and or standard Lithium or lead acid batteries. It should have build in AC power drivers. Had to be expandable or scalable. Standardized Interfaces and there for sensor manufacturer independent. Memory to store statistic measurements. This controller platform has a number of applications. Some are available and some are in a concept phase of development. Holamex works on the following applications. Battery heath monitor and charger. Load control for factories with high energy demand. High way traffic density counter. Smart Solar light post monitor and battery maintenance. CFE grid monitor with backup switch functionality.